As the home of Genever, aka ‘Dutch Courage’, gin fans have always had a lot to thank the Netherlands for. But now, this canal-covered country has gifted spirits enthusiasts with yet another amazing innovation: the Double Dutch tonic in your July Gin of the Month box. 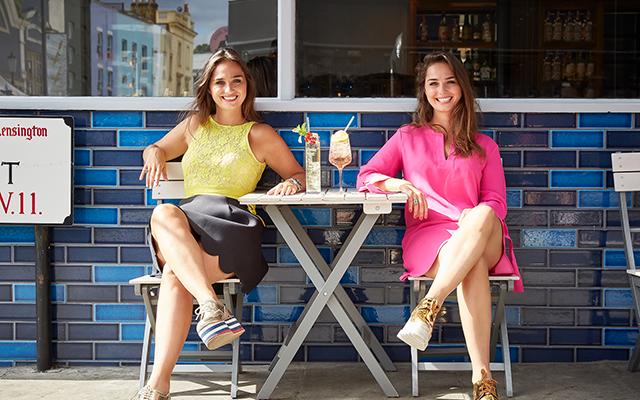 This premium line of tonics, famous amongst gin fans for a range of unique flavours, is the brainchild of twin sisters Raissa and Joyce, whose passion for craft spirits is a family affair. Raissa says, “Our parents were passionate about high-quality spirits their whole lives, which culminated in their very own little spirits section at home.” “A few years on, and we still love gin more than anything,” Joyce continues. “The classic G&T is a long-standing favourite back home, but we’re seeing more and more people wanting to innovate with flavours. The twins began making their own mixers in college, combining carbonated water with homemade syrups and inviting their friends round for tasting sessions. “While everyone else was doing Jägerbombs, we would have small parties with friends where they would bring gins, and we would provide the tonics,” laughs Raissa. Shortly after graduating, Joyce and Raissa decided that their homemade tonics were good enough to introduce to the world, and Double Dutch was born. When developing their range, they focused on flavour, using molecular gastronomy and food pairing techniques to create incredible flavour combinations like Pomegranate & Basil and the Cucumber & Watermelon in your July Gin of the Month box. While every Double Dutch tonic is tested to perfection, Joyce and Raissa say that the fruity little number in your July Gin of the Month box came together more easily than normal. “Cucumber and Watermelon is probably the drink in our range that came about the quickest,” Joyce says. Perfect as part of an ultra-refreshing gin and tonic for summer sipping, the Double Dutch mixer in your box is also great in cocktails.